DIY wreath tutorial how to make an easy ribbon Christmas wreath that makes a huge impact! 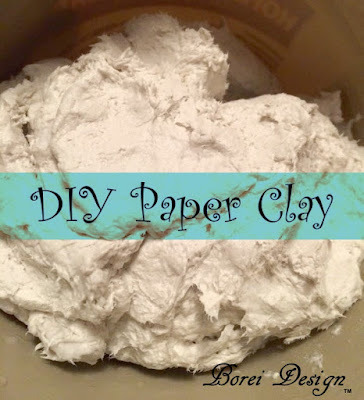 See my Easy Personalized Whitewashed Wood Signs or Ornaments Tutorial. This is a super easy way to make wood signs or ornaments and requires very little artistic skill or materials. 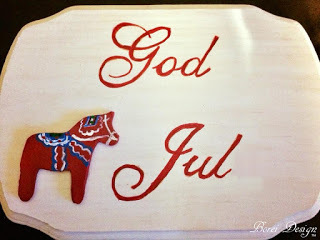 I created one that displays an Activa Hearty Clay Dala Horse and honors my husband's Swedish Christmas traditions but the sky is the limit with this tutorial. 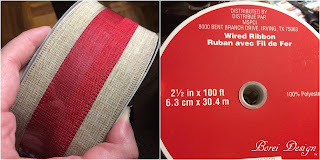 I used a 100 ft roll of 2.5 inch wide linen wire edged ribbon with a red stripe down the center that I got at Michael's (who had all Christmas ribbon 50% off sale at the time). I strongly suggest you hit a similar ribbon sale or use one of the 40% off one item coupons that is routinely available on both Hobby Lobby and Michael's websites. If you are unable to find a roll this large you may have to buy several smaller rolls. I used all but about a yard of this roll. It is possible to use less (or more) according to your judgement. 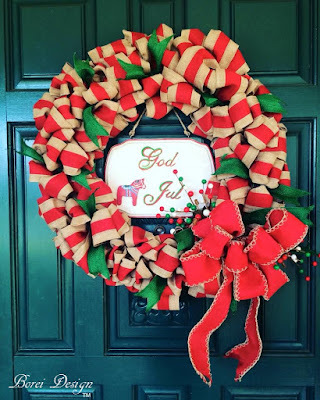 Just remember the more you use the fuller and "loopier" your wreath will be. 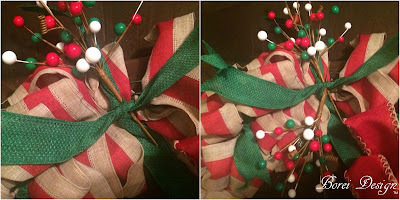 I tied in green single pieces of green ribbon as accents on the center bar/ring of the wreath form at various points in the wreath. I did not measure a certain amount for the first piece I cut. I just kind of estimated how much I wanted and made all the other pieces the size with the exception of where I was going to place the bow. I added two longer pieces there (just long enough to stick out from behind the coming bow), one on top of the other. 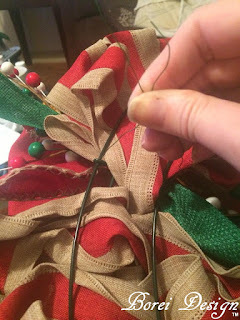 I added a finishing tail to each piece of ribbon by folding in half (both ways) and cutting at an angle before tying them into my wreath. See instructional photos below. Next I just stuck my floral picks in the double knot in the longer pieces of double tied accent ribbons (where the bow will go). Many people would use a hot glue gun to reinforce this but I like to make things removable or reusable so I can rework the wreath later if I choose to do so. If you would like to do the same but also want to reinforce the position of the picks, I suggest you use floral wire. I did not because I knew that I would be securely wiring a bow on top that would help hold the picks in place. I made my bow out of wired edge red ribbon that has jute accents on the sides. It is pretty much just a standard floral or florist bow. If you don't know how to make one, there are a gazillion and one YouTube videos on how to do just that so, I'm not going to add a new one. If you prefer to buy one instead, there are lots of gorgeous pre-made bows available in craft stores this time of the year. I added my bow on top of the longer pieces of green accent ribbon. To secure in place, I ran a piece of floral wire along the inside center of the bow, wrapped both ends around the back of the form, tied it and snipped off the excess. Now is the time to fluff all those little loops of ribbon you made for the body to make it pretty and hide the knots you made with the accent ribbon. Then it's ready for hanging. Here is my finished wreath hanging on my front door. I really hope you enjoyed this tutorial and it inspires your own creation. Until next time, Merry Christmas and Happy Crafting, my friends! This is such a gorgeous wreath! I love how it turned out. I might have to try to make one. I was just in Hobby Lobby admiring this ribbon! I love how it turned out. This wreath is such a cute idea. I already have all the supplies I need to make one. It will be a perfect pop of color for my door. This looks easy to do. I wish I can pull it off. Love the final look, so pretty! 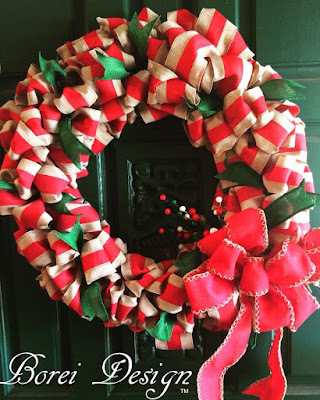 I love making wreath at home every year and this year I was little lazy and have’t make any yet. 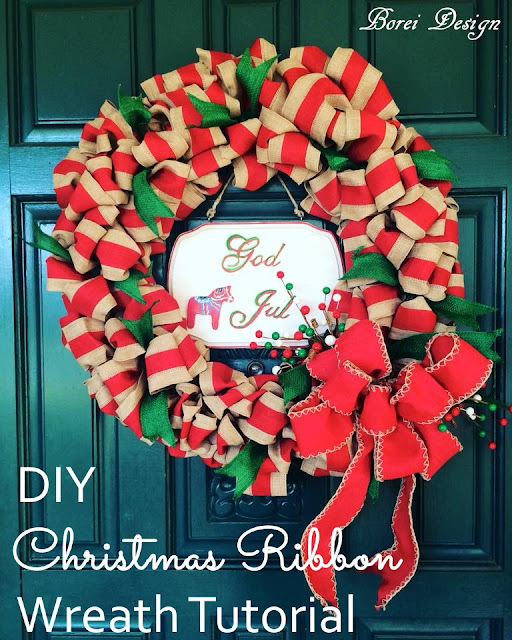 This is really fun Christmas Ribbon Wreath to try! Your wreath turned out so pretty. 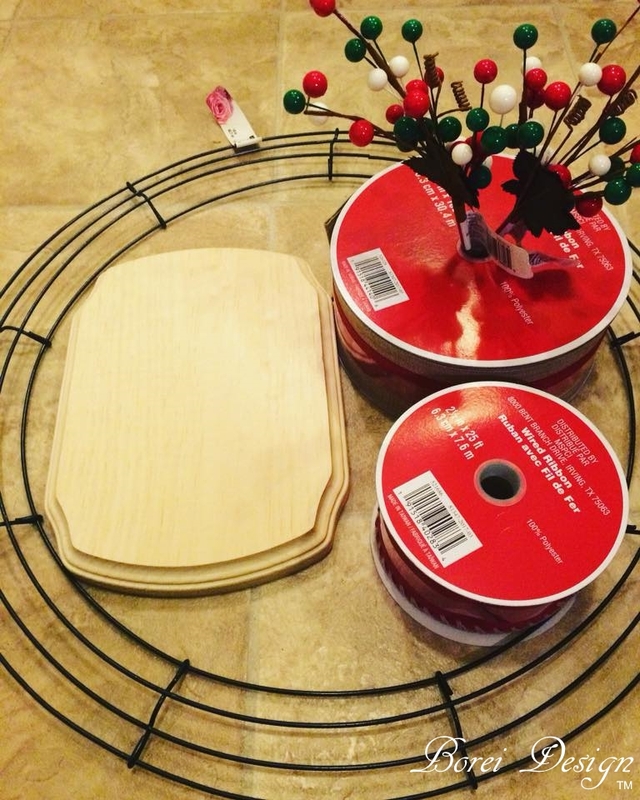 I love that you honored your husband's Sweedish Christmas traditions, too! Looks terrific. It definitely has that xmas aura to it. Love yours! I’ve never made a wreath before. Would be a fun craft to do with family. 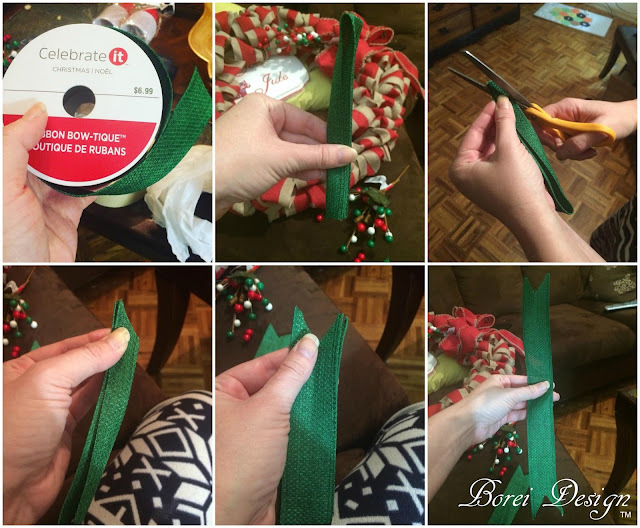 This How To Make A Christmas Ribbon Wreath DIY tutorial is so helpful! I'll try it later at home! That's such a unique looking wreath. 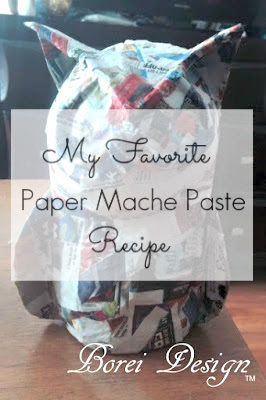 I love DIY projects that make items like them seem more personalized. I will have to make one for Valentine's Day. So beautiful. It reminds me of a poinsettia for some reason. Well done. 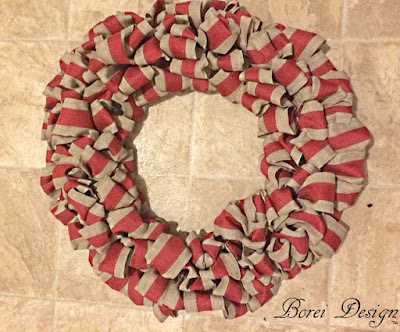 This is such a lovely looking Christmas Ribbon Wreath, an ingenious idea for sure. This makes me want to re-think my crafty abilities and see whether I can be able to make something this pretty. I love how it turned out so beautiful. Your comments and feedback is very much appreciated!